Kitty Hawk, North Carolina, February 12, 1903, Wright brothers test their new engine just after its completion of three months on their flyer. The Wright brothers made four ground runs before damaging this engine after heavy winds overturned their flyer. The engine is a four cylinder 12 horse power. The engine weighs just under two hundred pounds. 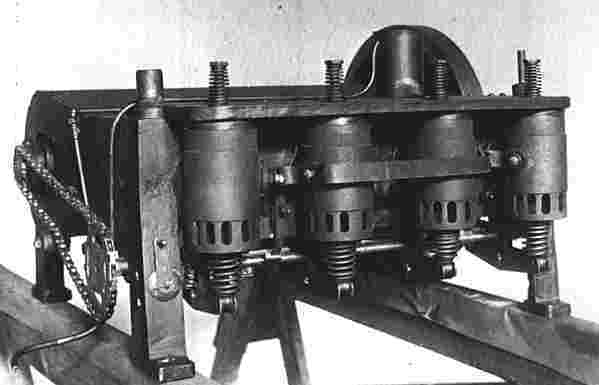 Rather than a distributor, the engine used a make and brake low tension ignition which was powered by a 10 volt magneto friction driven by a 15 inch, 26 LB flywheel. The fuel reached the engine by gravity through a copper pipe above the engine to a tin can where it then traveled to a hot water bottle that vaporized the fuel. The engine had no throttle and operated full speed. The engines drive shaft by chain turned the camshaft which opened the exhaust valves and operated the spark plug rocker arms. The Wrights designed all of their airplane engines. However, machinist Charles Taylor built them.